We never realized how much bread we eat until we took up the challenge of baking our own. Whether a slice of toast for breakfast, a quick sandwich at lunch, or something crusty to go alongside soup for supper, one way or another it’s on the table most every day. In the coming year, we’ll be trying out new recipes, experimenting with different flours, and, hopefully, become better bakers. It’ll give us a chance to put some newly acquired skills to practice, and, since learning and failing go hand in hand, you’re bound to see our mistakes as well as successes. The bread we most often buy is a sandwich loaf, and we started out with Daniel Leader’s Semolina Sandwich Loaf from his book, Local Breads. You may be familiar with semolina from making pasta, however, look for something more finely ground, such as King Arthur’s Extra Fancy Durum Flour (above). This is a straight dough, with everything mixed in at once, and weighing the ingredients into one bowl simplifies the process even further. In general, coarsely ground semolina needs to be combined with other flours for baking, whereas finely ground durum flour is suitable for recipes that require 100 percent semolina. As a comparison, we used whole grain durum flour from Fiddler’s Green Farm in one loaf (above left), and fine durum flour in the other (right). 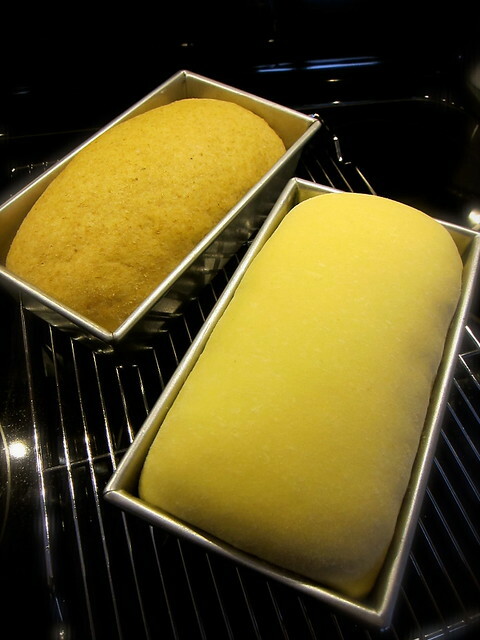 The difference between the loaves is noticeable though not surprising, as whole grain flours contain different levels of bran, protein, and gluten — factors which can influence the dough’s development. 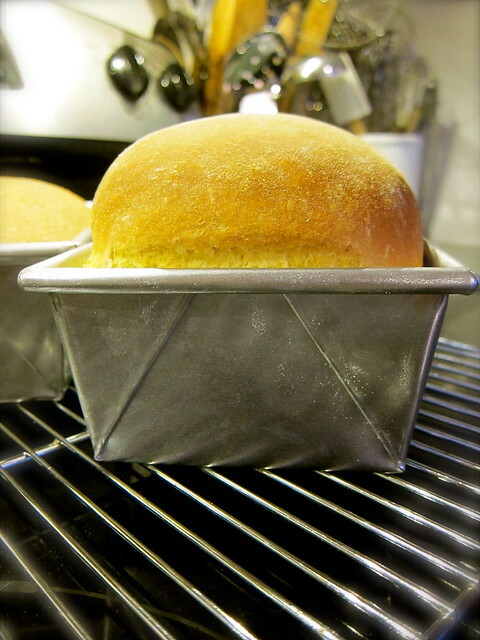 Some tips for a lofty loaf: We made sure to knead it long enough, shaped it with this method, and used a 1-pound loaf pan. Other than that, the recipe is a reliable one, especially if you weigh your ingredients, and it turns out a beautifully well-formed loaf. 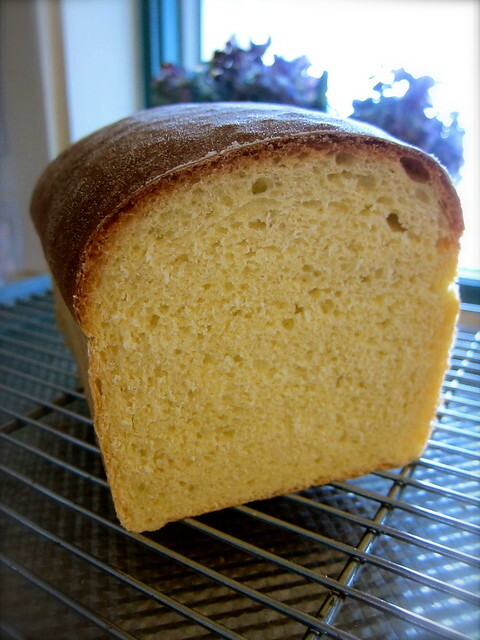 The even crumb is characteristic of bread made from semolina, as is its buttery golden hue. In addition to sandwiches, we’ve taken to using it for croutons, stuffing, and panzanella or bread salad. If any is leftover, it also makes excellent breadcrumbs. What the whole grain semolina loaf lacked in refinement is more than made up for in flavor. To be fair, Fiddler’s Green Farm grinds their flour to order, and the freshness is evident in this loaf’s almost sweet nutty quality. While living in the far reaches of New York’s Upper West Side, there was a bakery near our subway stop that sold onion and blue cheese bialys, a savory combination that we still find ourselves craving decades later. Like bagels, recipes for bialys vary widely, and the one from The Kitchn (above) came the closest to what we were imagining. We let the dough proof overnight to develop more flavor, and omitted the cream/butter glaze; it’s the dry surface that makes it a bialy. We had a hunk of Bayley Hazen Blue from Jasper Hill Farm on hand, but found that a milder and younger blue cheese would be more suitable. Here, we added the cheese after the bialys were baked. The next time, we’ll try adding the cheese beforehand to avoid over baking. 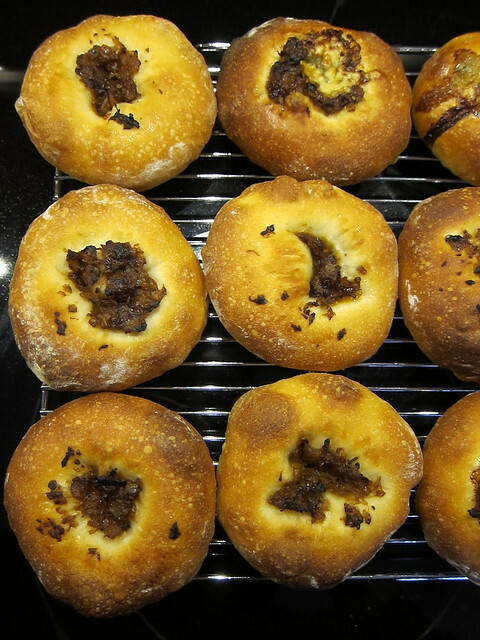 The bialy by which all others are judged come from Kossar’s Bialys, and Maggie Glezer’s recipe adaptation was worth tackling, if only to learn from our mistakes. In her book, Artisan Baking, she notes that the dough at Kossar’s is intentionally over mixed, which renders it slack and extensible. To replicate this, Glezer mixes the dough in a food processor. This technique pushed our processor to its limit, and it began to smell of burnt oil before we finish the required number of repeats. This gave us a puffier bialy than we would’ve liked, which then ended up overbaked (above) when we forgot to set the timer. We finished the month by baking Morning Buns, based on the ones from Beach Pea Baking Co. They’ve long been on our baking list but have proven tricky to duplicate. 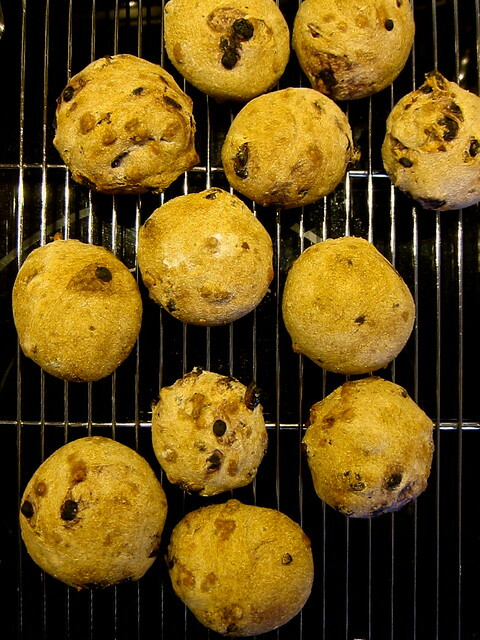 We used Rodale’s recipe for Whole-Wheat Walnut-Raisin Rolls as a base, which at a proportion of 4 cups of flour to 3 cups of water makes for a very slack dough. Working with the sticky dough, we lost our nerve and added too much flour, which made them overly dense. In sum, the Semolina Sandwich Loaf is a great introduction to baking with durum flour, and is a versatile bread to have on hand. Substituting whole grain semolina gave flavorful results, and it deserves another go with some tweaking in hydration and proofing time. Unless we want to buy a new processor, we’ll only use it to grind the onions, otherwise, we’ll stick with the bialy recipe from the Kitchn. As for the Morning Buns, they’re definitely a work in progress. This entry was posted in cooking and tagged baking, bialys, daily bread, local flour, rolls, semolina, whole wheat. Bookmark the permalink. Thanks for pulling together so many great bread recipes! I’m always looking for something to do with semolina, and this is a recipe (and book) I hadn’t heard of. I make about 4 loaves of bread a week. 4 loaves a week is certainly something to strive for! This challenge is in part to figure out how to fit baking into our daily schedule — any tips? The semolina recipe is from a chapter in Daniel Leader’s book on Altamura in Puglia, where we’ve visited (something of a pilgrimage) and the bread is traditionally 100% semolina. I’m not too much a romantic about the process of kneading, so I’m fine with using the mixer. I use recipes that yield two loaves, and get two recipes done in one day. Then, the freezer is my friend. I’m going to look up that book! Wow! Magnificent! I heart all but covet the onion bialy in particular. The bialys were surprisingly doable at home, though you must have good ones available to you in NY! My husband has started baking all the bread we eat too, but he hasn’t made a sandwich loaf as lovely as yours. And I’ll get right on him for making those bialys. They look AMAZING. We’ve detoured into English muffins lately and just bought a copy of that book for Leader’s recipe, and will have to check out his one for bialys!